From Goodreads.com: "Boston in 1775 is an island city occupied by British troops after a series of incendiary incidents by patriots who range from sober citizens to thuggish vigilantes. After the Boston Tea Party, British and American soldiers and Massachusetts residents have warily maneuvered around each other until April 19, when violence finally erupts at Lexington and Concord. In June, however, with the city cut off from supplies by a British blockade and Patriot militia poised in siege, skirmishes give way to outright war in the Battle of Bunker Hill. It would be the bloodiest battle of the Revolution to come, and the point of no return for the rebellious colonists. "Bunker Hill" is the story of the battle called by the same name that was the bloodiest battle of the American Revolution. Philbrick really makes the story of this battle and the people that were affected by and participated in the battle come to life. I did not know much about this battle before reading this book and found this book to be a really good primer on the battle. That being said, I think those that are familiar with the battle will still get a lot out of this book. I had read "Mayflower" by Philbrick several years ago and one thing that I really enjoyed about that book and this book is that Philbrick really does a great job of pulling you into the story. 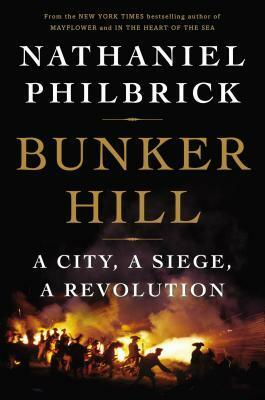 While there were some parts of "Bunker Hill" that were a little bit dry, most of the book is very engaging. Philbrick weaves the extensive research into a fascinating narrative. There are definitely some parts of the book that almost have a fiction feel to it. I don't mean that the detail feels fictional, I mean that the book is just that engaging and pulled together that you feel like you are reading a story rather than a non-fiction history book. I really liked that Philbrick focused a lot on the personalities and people that played some pretty major roles in this battle. I think learning about these people and who they were and why they wanted to be involved and what they were doing once they got involved. Because you are not only seeing the events but the people behind the events, I really think that you get a great picture of what happened. I think this book will definitely appeal to history lovers. Philbrick definitely knows his stuff. This book definitely whet my appetite to read more about the American Revolution. In his new book, Nathaniel Philbrick tells the story of the battle that transformed a revolution into a full-fledged war. Philbrick focuses his narrative on the little known Dr. Joseph Warren, the charismatic physician who was at the forefront of the revolution in Massachusetts during the spring of 1775 and was fated to die at Bunker Hill. What follows is an account of the events leading up to that historic battle in June 17, 1775. April 2: With tensions rising, patriot families begin to evacuate Boston. April 13: Massachusetts Provincial Congress directs the Committee of Safety to create six companies of artillery. April 17: Thomas Gage prepares his plan to send Col. Francis Smith and 700 troops to destroy rebel military stores in Concord. April 18: at 10 pm, British grenadiers and light infantry assemble at Boston Common for transportation to Cambridge; learning of the plan, Joseph Warren orders William Dawes and Paul Revere to alarm the countryside that the soldiers are headed to Concord. April 19: British regulars fire on militiamen at Lexington Green, killing eight and wounding ten; later in the day, men die on both sides during a clash at Concord’s North Bridge. April 20: Thousands of patriot militiamen from towns throughout Massachusetts flood into Cambridge and Roxbury. April 23: Admiral Graves begins building a gun battery on Copp’s Hill in Boston’s North End; the Provincial Congress reconvenes at Watertown and elects Joseph Warren as President. May 27: General Israel Putnam captures and burns the British schooner Diana in the Battle of Chelsea Creek. June 14: Joseph Warren is appointed a major general in the provincial army. June 16: At 6 p.m. Colonel William Prescott and 1,000 soldiers assemble in Cambridge with instructions to build a redoubt on Bunker Hill; for reasons that remain unclear to this day, they build the fortification on Breed’s Hill instead. June 17: Joseph Warren is killed during the final stages of the Battle of Bunker Hill, which proves to be the bloodiest engagement of the Revolution. complex, disturbing, inspiring, and just plain interesting than I could have ever imagined. How have your past books informed your research and writing for BUNKER HILL? on a hot, almost windless day in June. into the whaling worlds of In the Heart of the Sea and my history of Nantucket, Away Off Shore. How did you go about your research for BUNKER HILL? Jr. at a clam shack on Cape Cod. What did you discover in your research that surprised you? freedom as the patriots of Boston. but from its supposed savior, George Washington. our history books? Who are some other noteworthy characters? sentinel as his “observe-a-Tory.” The list goes on and on. Boston and Boston Harbor, is atop the 221-foot-high Bunker Hill monument in Charlestown. uprisings in the Middle East. Can you address some of the parallels? it was about ordinary Americans suddenly finding a new way to enter the political conversation. sacred memories of a conflict that changed not only the course of his own life, but of a nation. What do you want people to take away from reading BUNKER HILL? I love reading about the American Revolution - I am actually reading about Benedict Arnold right now. I have had Philbrick's Mayflower on my reading list for awhile. I love when non-fiction has a narrative feel to it - especially when listening to it on an audiobook. I'll keep this one in mind for the American Revolution reading challenge!